The poor girl is in trouble! The bloodthirsty zombies are all around and there is nobody near to help her! Use your super weapon and shoot all the zombies from the distance! Do not let the lady down! 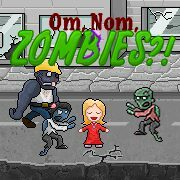 Games Similar Om, Nom, Zombies? !